Probably about 6 months before I was hired by Riya.com, I was interviewed by a VP of Interactive at Chapters Indigo in Toronto. I think that interview was a couple years ahead of it's time. 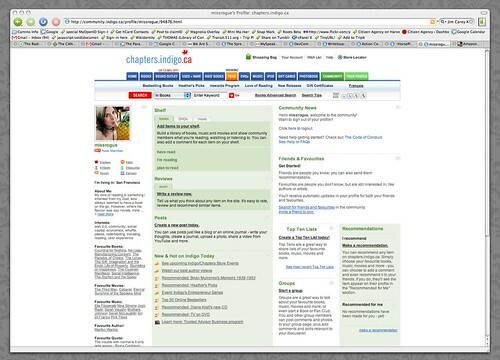 I remember really struggling to explain why Chapters Indigo needed the idea of online community and community tools. Saying, "When people go into your store, there is a warmth. They sit and read with others, sometimes comparing notes. I've bought many books based on a discussion I've had with the shopper sitting next to me. That would be amazing to find a way to replicate online." The VP looked at me with doubt, shook my hand and never followed up. Chapters.Indigo.ca, Canada’s online bookstore, is currently soft-launching a new social networking application for Canadian booklovers. The official announcement has not yet been made, and the press release won’t go out on the wire for another week; we wanted to give you advance notice before the news broke, and we can provide you with answers to any questions you have about the application or specific screenshots you might want. What’s unique about this program is that it’s a complex and highly-functional social networking application built with a very specific community in mind. In addition to functions on more broadly-targeted social networking sites, Indigo’s community members can reach out to other members in order to form book clubs, recommend books, or write reviews, all with other Canadian booklovers. Right now the community is visible from Indigo’s homepage (the green tabs in the upper-right corner), or you can click directly: http://www.chapters.indigo.ca/community/. Now, before I go on, I should point out that is this an example respectfully written PR note (notice, he didn't pretend to have read my blog) that was sent because I am a customer (not a blogger - thus demonstrating the desire to let their customers into the scoop before the press...which is awesome). But besides being pleasantly surprised by the good PR move, I was shocked with the content. Chapters Indigo has launched a social network!? Man, I wish I could remember the name of the VP Interactive I interviewed with. I'd LOVE to drop her an email and say, "Congrats! I wasn't so clear on describing it at the time, but this is what I meant!"